The year 1982 was a watershed year in architecture and design. Japanese fashion designer Rei Kawakubo, founder of Comme des Garcons, presented her groundbreaking collection on the runway in Paris. 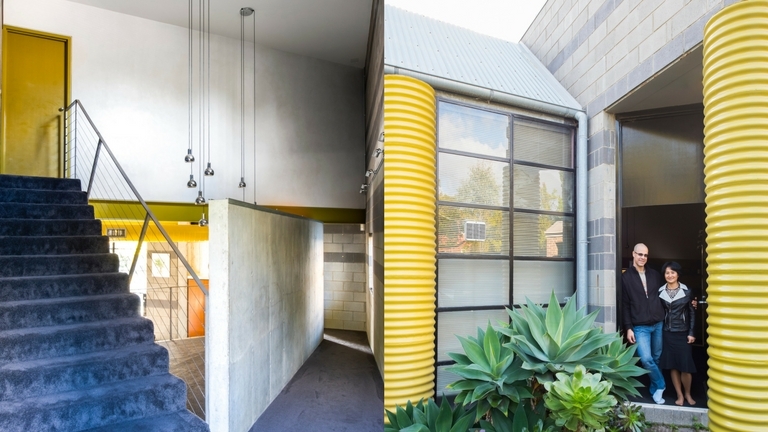 On the other side of the world, architect John Davey, then only 32, was completing the finishing touches to his brutalist-style family home in East Hawthorn. Davey was inspired by the Mexican architect Luis Barragan and the Paris Pompidou Centre, designed by architects Richard and Sue Rogers with Renzo Piano. The use of colourful painted pipes straddling the gallery’s exterior became a talking point. “I always loved the way Barragan used colour and manipulated natural light as it entered a house,” says Davey, who embraced the same bold colours, including fuchsia pinks, mauves and colbalt blue for both the interior and exterior. Home to Davey and his family for 23 years, the East Hawthorn house has now had a number of owners, some changing a few colours and interior finishes, including painting all the window frames from fuchsia to black. For the last three years, Davey’s masterpiece has been home to Philipp Schluter, his wife Liz Wu and their two young children Edith and Esther. “We were renting a house a few streets away and have always loved this pocket of Hawthorn. As the children settled into their school, we were keen to remain in the area,” says Schluter, who would walk around the neighbourhood after school drop-offs, looking for a potential home to purchase. “Liz and I must have looked at between 50 and 60 houses in a six-week period,” he adds. When the couple inspected this house, Liz’s remark was simply, ‘It has to be this one. Everything else is quite boring by comparison’. “None of the rooms are square (many are triangular in shape) and the ceiling heights are so varied,” says Wu, pointing out the ceiling heights that extend up to six metres. “I was keen for my children to grow up in a house that seemed to say so much more than a conventional house does,” she adds. For Schluter, who grew up in Berlin and Wu, in China, there’s also a history of living in concrete houses. “This house is so solid. The first thing you notice are these beautiful concrete walls,” he says. Few changes have been made to the house in the last three years. 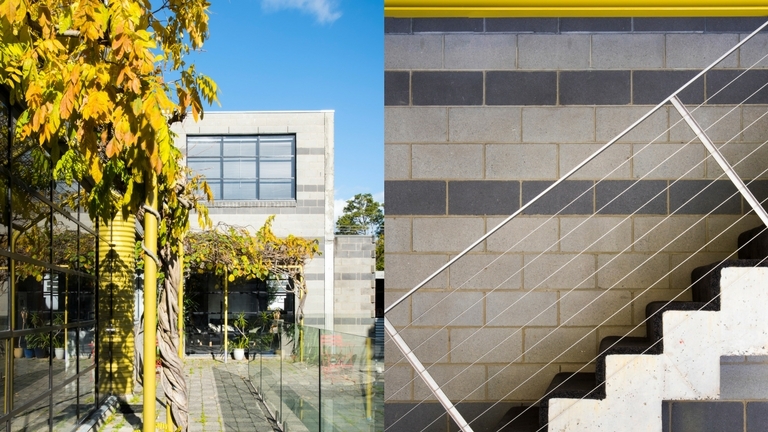 The 60-square- metre garage has been transformed into a rumpus room for the children and glass balustrades that enclose the swimming pool were added as soon as the family moved in. A new deck above the rumpus room was also added to increase the outdoor space. However, the house still ‘reads’ as Davey’s original vision. The formal living areas at the front of the house are finely conceived over two splitlevels, with exposed concrete walls in each area. Steel and glass industrialstyle windows in the living areas, also create a warehouse feel to the home. Although the Hawthorn house is spacious, spread over two levels and over 325 square metres in area, the family gravitates to the kitchen and informal meals area, orientated to the swimming pool. Wisteria on the customised steel trellises, both on the north and western elevation, diffuse the afternoon sunlight. “I love simply lying on the carpet in the living room and seeing the light from the swimming pool reflect on the concrete ceiling,” says Schluter. “You just wouldn’t get the same effect with a plaster ceiling,” he adds. As with the angular rooms, Davey’s house is totally unique. There’s a gentle ramp leading from the front door to the formal living areas and the undercroft of the concrete stairs (two sets, with one leading the main bedroom and the other to the children’s wing) is expressed rather than concealed. The ribbed steel columns, painted in hues of chartreuse and vibrant yellow, are both structural and decorative. “They were originally used as water tanks, but have been filled with concrete for strength,” says Schluter. And while expressed steel beams are now common to contemporary architecture, in 1982 such a treatment would have been considered ‘unfinished’. While time has moved on and a few changes have been made to the home, there are still a delightful array of original features, including trellis-like garden screens and even a gate at the top of the stairs, also in a trellis design, that would have made the house secure for Davey’s young children at the time. 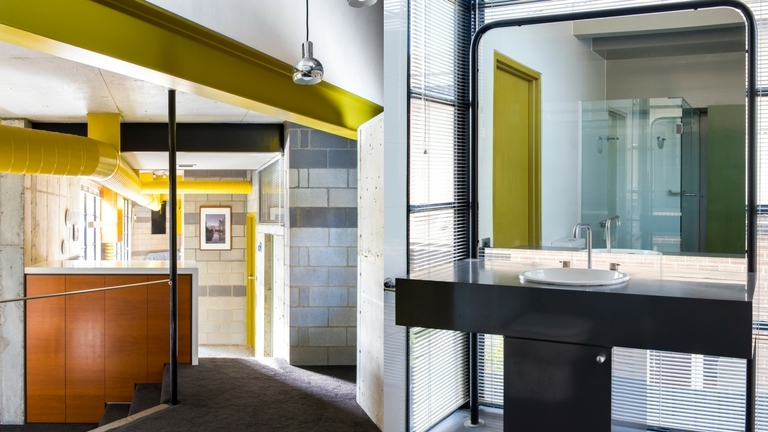 The ensuite bathroom with its original tap ware and its unusual built-in vanity mirror framed by steel, is as delightful and innovative today. “My family was never upset about returning home from holidays. With all the colour, there was the vibrancy and excitement of coming home to another resort,” adds Davey.